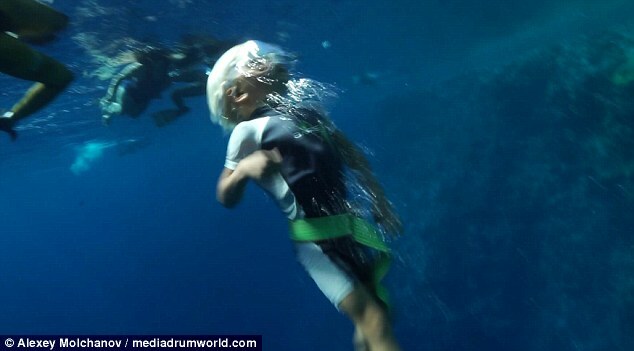 This astonishing footage shows the world’s youngest freediver plunging 32 feet under the sea aged just three. Fedor Afonasiev has been diving without aged oxygen since he was a two-year-old, following in the footsteps of his adventurous parents. 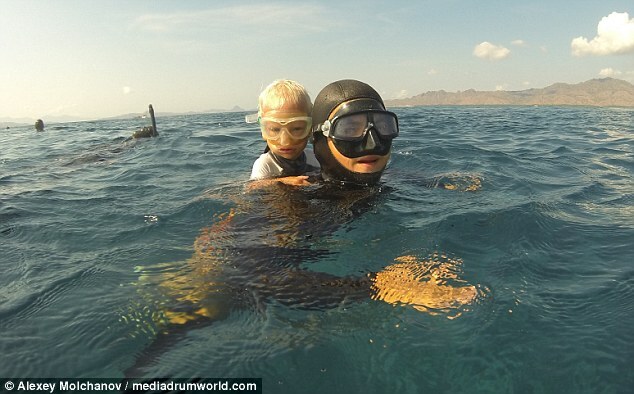 Fedor, whose parents are instructors, is also seen riding on his mother’s back in video taken by professional freediver Alexey Molchanov, 29, from Moscow. ‘This project of shooting with Fedor appeared natural when I saw him in the water,’ said Alexey. Alexey used a GoPro camera to capture the video footage. As an experienced freediver Alexey can hold his breath for eight minutes and thirty-three seconds. He holds a world record depth of 423 feet while depth diving with fins. ‘There is no competitive approach for kids,’ he said. ‘We do not push Fedor to do any numbers. He does whatever he feels comfortable with. That is very important to note for any kid’s breath hold activity. 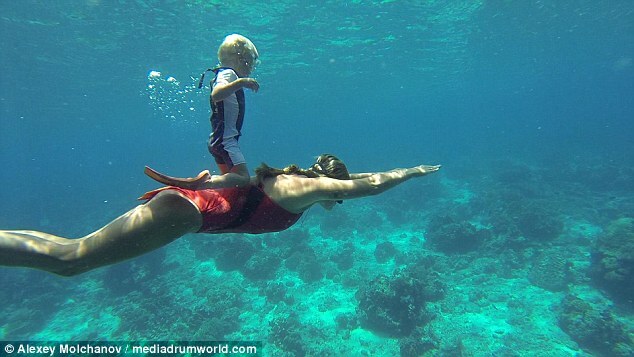 ‘We think it is important for freediving to be a fun activity for kids. The Blue Hole, which is just north of Dahab in Egypt, is popular with divers all year round.